We (New Zealand) has been in the news this week for all of the wrong reasons. A 7.8 magnitude quake in the South Island with rural communities like Waiau and Kaikoura hit the hardest. Being only 2 1/2 hours south of the epicenter of the quake, those of us in Christchurch felt it strongly – shaking and rolling for almost a full 2 minutes. We’ve been through this in 2010 and again in 2011 – and our city is still rebuilding. I decided that the item on my TO DO list to refresh my emergency supplies had better go to the top. We know that we have many fault lines in the country and shaking on one can trigger activity in another. Basically all New Zealanders should be ready for quake activity at all times. I have refilled my drinking water supplies (40 litres), for example. I aim to do this every 6 months and so I have marked my calendar for when 6 months is up. I bought new resealable containers this weekend and filled them with Izzy’s dry food., and I’ve taken the time to put more of my supplies in one place – the large plastic container is also new. First aid kits for humans and dogs are in there. Also a dog bowl, extra leash and collar. Copies of Izzy’s vaccination record, microchip number and pet insurance are inside a zipped plastic bag and saved electronically in the cloud. We forget sometimes how much we rely on electronic records. If the Big One hits, our power supplies will be down for some time. Good old hard copies are worth keeping and updating. I even realised that my email address on the NZ Companion Animal Register for Izzy’s microchip is outdated and so I’ll be phoning them in the morning to change it. My water purification tablets have expired. So a trip to the pharmacy this week is planned. Izzy has a spare dog coat packed, along with a towel and temporary bed. A new tennis ball for fun is also packed. I’ve also ordered some more dehydrated dog food. And one of the things that many emergency lists forget is a stake and chain – which I have had for years. In a severe earthquake, fences will come down. Your dog will need to be restrained safely wherever you are and you cannot rely on rope to tie them up. A stressed dog can chew through that in minutes and be gone. From personal experience, I can tell you that during the first earthquake of 2010, I was much more calm knowing that I had supplies and was prepared. I set about checking the safety of my house and setting up things like an emergency toilet…I was ready! If you don’t prepare for yourself, then do it for your dog. They rely on us for the care and safety. This morning, at just after midnight, we in Canterbury (New Zealand) were waken by another severe earthquake of magnitude 7.5. The epicentre was north of us, and while we shook and rolled for a long time, we have escaped severe damage and injury. It now appears at least 2 others have lost their lives and there is major damage in some areas. Earthquakes and natural disasters put things into perspective. Back in World War II, the motto in England was “Keep Calm and Carry On.” Izzy personified this by going back to sleep (and I mean sound asleep) within an hour of the big shake. She’s continued to sleep through aftershocks which are an inevitable consequence of earthquakes. It seems we can learn a lot from our dogs. 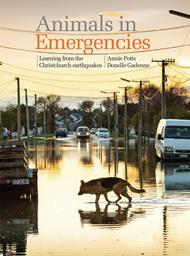 I have just finished reading Animals in Emergencies: Learning from the Christchurch earthquakes by Annie Potts and Donelle Gadenne. This was a must-read book for me. Why? I’m in it! I found the first 90% of the book the most enjoyable. Filled with stories of rescue, sheltering and individual owner’s tales of the earthquakes, the book serves to document – largely in the first person – the historical accounts of the days, weeks and months following the quakes. And I like the fact that the book doesn’t just focus on companion animal dogs and cats, but also includes stories about horses, fish, hedgehogs and other species. But the last 10% of the book is rather disappointing (and it hurts me to have to say this). Since New Zealand is a production-based economy, this book had to focus on the fate of production animals. But this is also where the book loses its tone and momentum. Either the authors asked for interviews with farmers and researchers and were rejected, or they simply didn’t ask – we’ll never know. Perhaps because of the lack of firsthand accounts, the book becomes too formal in its approach to describing the impact on farm animals and animals used in research. The text uses citations from newspaper articles at this point and becomes ‘preachy’ in terms of animal welfare. As someone with a personal interest in animal welfare management, the issues raised in the book are not new but the distinct ‘lessons learned from Christchurch’ is very much lost on the reader. I’m pleased this book has been produced and I’m very honored to have my story told although I know that I’m a very small contributor to the overall efforts to assist animals following the quakes. Animals in Emergencies has been distributed to booksellers worldwide and a paperback version is available on Amazon.com. WSPA (The World Society for the Protection of Animals) has a downloadable pack of information to help you prepare for your dog’s care in the event of a natural disaster. This kit will show you what preparations you should undertake in case your dog and you face an emergency situation. 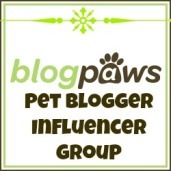 These are things like ensuring you have at least 3 days of food stored for both you and your dogs and that you have a sufficient supply of your dog’s medications, too. The kit recommends that your dog is able to come to you on command and to practice moving to safe parts of your house in the event of an emergency, like a tornado or hurricane. All very useful information! Take it from those of us who have faced natural disaster (earthquakes – too many of them! ), being prepared gives you peace of mind and results in less stress during very stressful events.